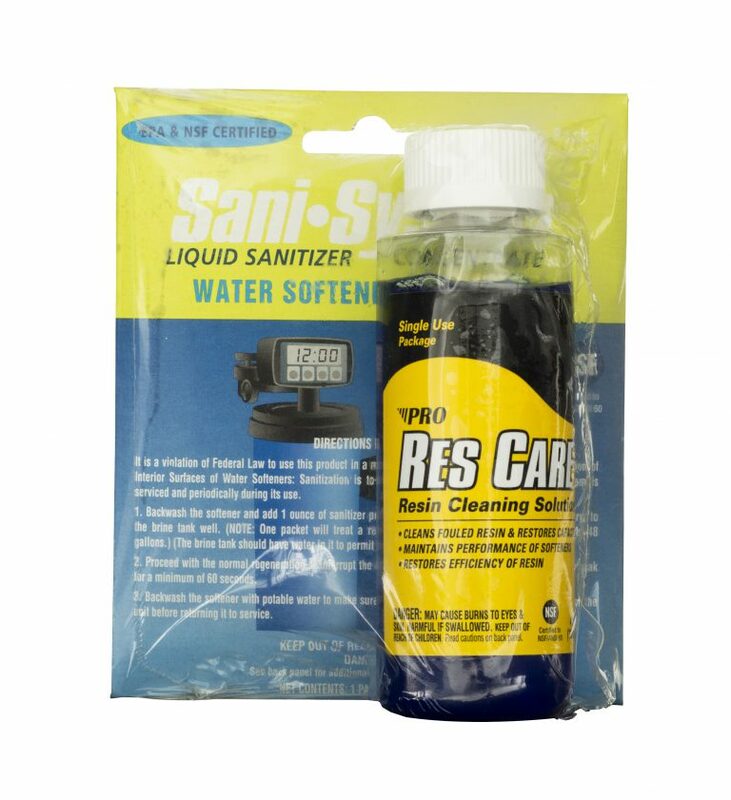 COMBINES THE INDUSTRY’S ONLY EPA REGISTERED & NSF APPROVED SANITIZER WITH RES CARE®, THE INDUSTRY’S #1 RESIN CLEANER. The new Sani-System® Clean & Sanitize Kit contains both Sani-System® liquid sanitizer and Pro Res Care® resin cleaning solution in handy single-use doses. Sani-System® is the only EPA registered and NSF approved sanitizer for use in water softeners. It’s proven to kill 99.99% of harmful bacteria without the use of chlorine, oxidizers or acids that can harm system equipment, parts and resin. Pro Res Care® restores softener beads and control valve parts to peak efficiency and maintains the life of the unit. Get the best of both worlds when using Sani-System Clean & Sanitize kit! Step 1. Pour entire contents of the Pro Res Care® bottle directly into brine well. For softeners with no brine well, pour directly into the salt tank when the salt level is low. Step 2. Pour entire contents of the Sani-System® packet directly into the brine well. Step 3. Manually regenerate the unit or allow regular regeneration to occur.